If you want to use something like an old Ford door handle or any that rotate and have a shaft running though, but would like to use stock VW latch, I just finished it and it works. Initially I was doing something real simple with a threaded rod and heim joints at each end. I got rid of the parts of the stock VW latch that I didnt need, but don't forget that you need to also open it from inside - I screwed one up and took too many pieces out. I also used an early style interior handle was easy to adapt (added 1/2" to the tab that connects to the rod). This initial design worked fine in mock up until I installed the door and closed it - The solid link forced the outside handle up when I closed the door. Not acceptable, plus I needed a little more spring to keep the exterior latch in a horizontal position. Time to rethink. Used a cut down BMW serpentine belt to provide a flexible link (BMW because my buddy had one in his trash can) - anything reasonably strong a flexible will work. I almost used a dog leash. I made an aluminum bracket that I pop riveted to the belt and ran the threaded rod from the heim joint to it. This gives me adjustment if I need it. At the handle, its just an aluminum block rounded on the backside so the belt runs smoothly over it and I screwed the belt to the block. I made a coil spring from a throttle return spring and an aluminum angle to act as a stop so you cant turn the exterior handle the wrong way. Cheap, relatively easy and it works like a dream. 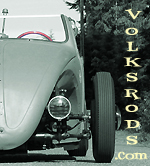 One more thing - if you look at the VW latch, you'll see a 1/4 20 bolt near the bottom of the pic. This acts as a stop for part of the mechanism. Without it, the one arm slides over a bump that held a part of the latch that I removed, and it can stick. [SIGPIC][/SIGPIC], 61 Cal look, "stock" 65 Bug, 69 VW woodie, 70s vintage Manx clone, 73 bug based hearse project, 67 "T" project and a 66 with probable Suby transplant. Last edited by andk5591; September 17th, 2010 at 03:09 PM. I never knew i looked so good until i was diagnosed with ms. Thanks - I was suprised something like this wasn't posted before - I had searched before I did it and couldn't find any. I hope someone can benefit from it. Old post but it just saved me a ton of thinking... Thanks for the post!